An English-language collection of the sayings and lessons of an important Muslim teacher. 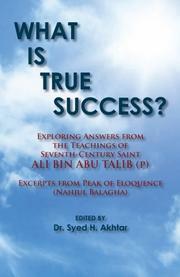 Ali bin Abu Talib was the son-in-law and cousin of the Prophet Muhammad and the first male convert to Islam. In this book, Akhtar organizes Ali’s writings and teaching into subjects ranging from God, the world, the afterlife, justice and politics, among others. Given the scattered nature of Ali’s writings, this book may certainly serve as a handy sourcebook for those looking to his words for comfort and guidance. However, it is unclear who the intended audience is—it seems that Akhtar wants to introduce the well-known teacher to those unfamiliar with him, in which case such a reader would be better served by more encompassing context of Ali, his time period and his role in Islamic theology to supplement the existing short chapter introductions and numerous appendices with brief information about Ali’s life, sources and various references. There are lists of Ali’s quotes for ready reference, as well as the sayings of well-known figures about Ali, helping even the most unfamiliar reader at least piece together his importance. The wisdom offered in the book is valuable and inspiring, and Akhtar has obviously taken care to cultivate the sections and, according to the acknowledgements, consult with experts in the field. On the other hand, he seems to have paraphrased his book from an existing English translation, further muddying the book’s ultimate purpose and audience and calling into question the fidelity of his translation. Nevertheless, the content of the book—the theology and spirit of Ali—shines through in a clear, sincere way that is sure to inspire the reader even if it lends nothing new to their understanding. A helpful reference for those familiar with the topic; a compelling but confusing jumping-off point for those who wish to know more.